In the early 2000s, a young and talented Oakland Athletics ball club appeared on the cusp of clearing a long pesky obstacle by finally upending the New York Yankees in the playoffs. Up to 2-0 in the series, the A’s were in an advantageous position, that is, until Jeremy Giambi, a lumbering figure who is also the brother of the team’s then-superstar Jason Giambi, seemingly forgot the most elemental of baseball acts. He didn’t slide at home plate and was tagged out on a glorious play by Derek Jeter. “Slide, Jeremy, slide!” is a phrase that curdles the blood of many A’s fans, but the appearance of another unforced error last week, this one political, could have similarly painful ramifications for its loyal fans. 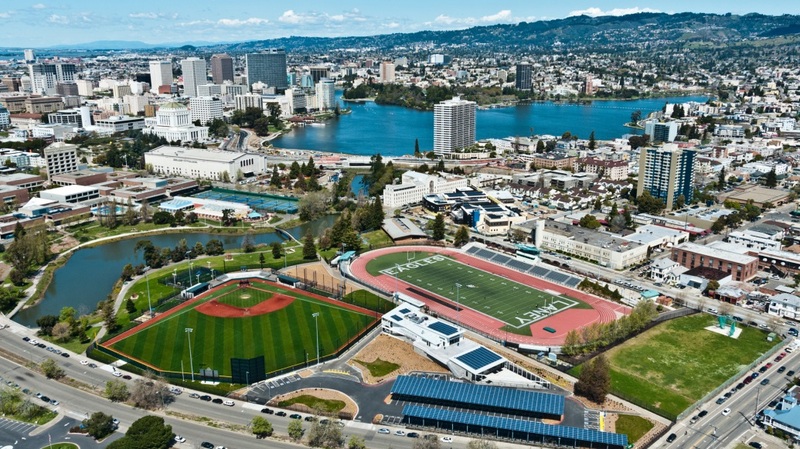 In numerous conversations with Oakland and Alameda County officials, some involved in the talks with the A’s for a new ballpark, others on the periphery, nearly all were blindsided by the Peralta Community College District Board of Trustees’ decision last week to cut off all talks involving the sale of district property near Laney College to the A’s for a new ballpark. Furthermore there is breathless astonishment across a wide spectrum of politicos who simply cannot believe A’s management led by team President Dave Kaval had not beforehand secured a simple understand with the Peralta board to at least to continue early talks over the property. “It’s embarrassing,” said one official. To add to their astonishment over last week’s announcement, a number of officials describe Kaval as honest, affable and capable, and as one official said, “someone with excellent leadership qualities.” However, going to back to the summer, two members of the Oakland-Alameda County Coliseum Joint Powers Authority, questioned whether Kaval’s team was too inexperienced for the job. It’s not clear whether those doubts were prescient in light of last week’s major setback or whether the issue was solely a horrendous political miscalculation by A’s management. When asked whether the proposed ballpark is, indeed, a possible “bait-and-switch” by the team to eventually skip town, a conspiracy theory proffered two weeks ago by Alameda County Supervisor Nate Miley, few believed the notion had any credence, but confusion still abounds. But the seeds of the Peralta ballpark’s demise were also apparent. 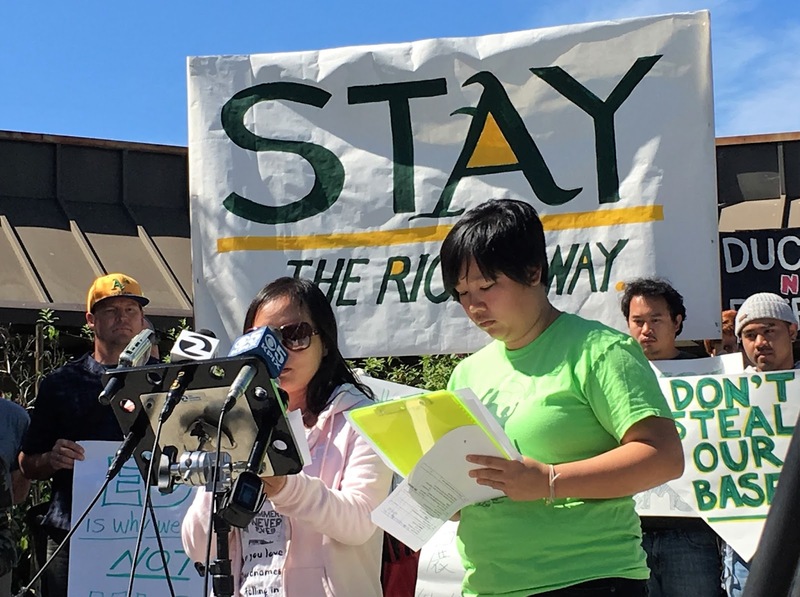 In the months since the A’s announced plans to seek a new ballpark near Laney College, community activists quickly gained an upper hand in raising objections to the proposed ballpark. The decision to build in the Chinatown/East Lake neighborhoods would lead to gentrification and push out various South Asian , immigrant communities in the area, said activists. Whether the objections by activists were filtering down to Oaklanders is unclear, but, as some Alameda County politicos noted, the Peralta board is extremely progressive even by the county’s dark blue politics. In that sense, it’s no surprise the Peralta trustees heard the activists’ concerns loud and clear from the start, they said. Conversely, there is also a theory that the Peralta board’s move to quickly end talks with the A’s could also be a negotiating ploy to gain a more lucrative deal for the land. Ballpark opponentss appeared wary even after the Peralta chancellor was ordered to cease talks with the A’s. The board’s statement, according to the ballpark opponent group, Stay the Right Way, seemed ambiguous. Days later, the group marched on the chancellor’s office to demand an unequivocal statement that negotiations with the A’s would never start again. The resumption of uncertainty over a new ballpark for the A’s was seized upon by several Oakland officials, including Kaplan and Councilmember Dan Kalb, who quickly urged the team to revisit building at the current Coliseum site. Kaplan believes the A’s can make money at the Coliseum when the absence of certain regulatory costs associated with the site are factored in, especially environmental studies already secured at the Coliseum. “I think they underestimate CEQA clearance,” Kaplan said of A’s management. Similarly, over the weekend on social media, Kalb said it was “BS” that the A’s could not make money by building at the Coliseum. Meanwhile, A’s fans head into the holiday season yet again with worries about the fate of their beloved team. If the Peralta ballpark dream was thwarted by a Jeremy Giambi-like colossal error, then A’s fans may not want to look back on team history for what might come next. Two years after the infamous no-slide in 2001, rambunctious A’s outfielder Eric Byrnes made a similar playoff error in Game 3 against the Boston Red Sox. In this case, Byrnes remembered to slide. However, he forgot to step on the plate and the A’s blew yet another postseason appearance. Posted in Athletics, coliseum, Dan Kalb, Dave Kaval, Nate Miley, Peralta ballpark, Peralta Board of Trustees. Bookmark the permalink. While perhaps the politicians were surprised that the A's supposed plans to build a ballpark at the Peralta site blew up, however I wasn't. Let's look at a few of the possibilities. Perhaps the A's had no real interest in building a ballpark that would seat only 35K people at the Peralta site, perhaps they were hoping eventually the city and/or county would come up with considerable money so as to facilitate the construction of a much larger ballpark at Peralta or somewhere else in Oakland, perhaps they intended to leave Oakland altogether, or perhaps it was a combination of factors, and including maybe one or more of the just mentioned. But regardless, I seriously doubt the A's were ever really and sincerely interested in building a stadium at the Peralta site WITH THEIR OWN MONEY that would seat only 35K people. I was at the game. Upper deck. No one was yelling for JG to slide in the moment because Jeter seemed to have come out of nowhere to make a miraculous play. But he was also backing up the throw or, in other words, doing something he was generally supposed to do. If our local pols could do that for a change. Even years ago, when the A's ownership was looking at Fremont and San Jose, the size of the proposed new park was still around 35,000. That argument holds no water at all.